Very Long Baseline Interferometry (VLBI) is a radio astronomy technique developed in the 80�s to study the detailed structure of compact radio sources with a high angular resolution, but whose applications in the geodesy field have been soon exploited. Pairs of independent ground-based telescopes, operating in the radio window between 0.5 and 22 GHz, are connected via precise atomic clocks, thus acting as an interferometer whose ’base’ is the distance between the two antennas. Data-streams from pairs of telescopes registering time-tagged signals from a radio source are shifted by a ’correlator’ until the signal time delay t is detected: t is the fundamental VLBI geodetic observable. The VLBI time delay t is a very neat geodetic observable, giving a unique contribution in the determination of the celestial reference frame, intended as a set of QUASAR coordinates, and its relations with the terrestrial reference frame, in particular the small variations of precession and nutation. As of 2009, 28 VLBI permanent telescopes are active in the world, whose raw observational data are correlated by 6 correlators. The experiment schedules and data acquisition/dissemination policies are decided within the International VLBI Service (IVS), grouping all the worldwide VLBI components, from telescopes to data centers to analysis centers. 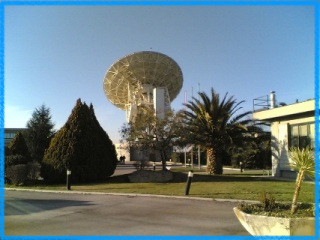 The VLBI telescope at ASI/CGS, with a 20-meter diameter antenna receiving signals in S-BAND (2210*2350 MHz) and in X-BAND (8180*8580 MHz), fully operational since May 1990, characterizes Matera as a ’fundamental’ geodetic site, i.e. a site where the co-location of several space geodetic systems enables to establish the interconnection among reference frames determined by different space geodesy techniques networks. ASI/CGS has been performing data acquisition and analysis activities since 90�s and, since its start, takes part actively to IVS, both as Network Station and as Analysis Center.